Many consumers receive calls and letters from debt collectors. Most of these are from debt collection businesses collecting on valid debts. In some cases, though, the caller may not be a collector at all. It could be a scam artist pretending to be a debt collector. This guide will help you learn about and avoid scams and give you tips on how to work with debt collectors to resolve your debt. Don’t avoid real debt collectors. If you owe the debt: Work with the debt collector to find the solution that is best for you. If you avoid their calls or letters, they may take more aggressive steps to collect. They could file a lawsuit against you, or put the debt on your credit report, if they haven’t done that already. Debt collectors often are able to set up an affordable payment plan or even accept less than the full balance to close the account. Discuss these options with the collector. Collectors must verify that you are the correct person to speak with about the debt. By law, they must check your identity so they don’t talk about you or your debt with others who don’t have a right to know. Likewise, you will want to verify that the caller is a legitimate debt collector. The chart below can help you sort out who’s calling. Just because you don’t recognize the name of the company doesn’t mean it’s a scam. Debts are sometimes legally sold, customer service providers change (especially for mortgages and student loans) and companies (especially banks) are bought by other companies. If you suspect the caller is a crook: Ask the caller to send you written information about the debt and the collection agency. Tell the caller you won’t discuss the debt until you receive the letter. Once you get proof that the caller is a real debt collector and the debt is yours, discuss your case and explain your situation. During the call, you might also discuss possible repayment options. Once you are comfortable it’s your debt and have a chance to review your finances, consider committing to a repayment plan that you can keep up with. Stay calm. Try not to raise your voice. Write down and keep details about all phone calls, including dates, times and topics discussed, and any letters or emails you receive. If you cannot reach an agreement for repayment, or you do not want the debt collector to call you for any reason, write to the debt collection company and ask it to stop calling. 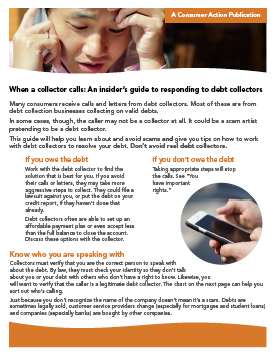 If you tell the collector to stop calling, it doesn’t mean the debt will go away. You may still get sued for the debt or it may be reported to the credit bureaus. (You must be informed when a lawsuit is filed. Never ignore such notices!) Staying in contact might be a better option. You have the right to request verification (proof) of the debt, as well as the name and address of the original creditor. You must make your request in writing to the debt collector within 30 days of receiving a “validation notice.” (This validation notice, which must be sent to you within five days of the collector’s first contact, contains important information about the debt.) However, you may dispute a debt at any time. If you ask for verification (proof) of the debt and/or information about the original credit account, the debt collector must stop efforts to collect from you until they have responded. If you prefer to be contacted in a different way (cell phone, text message, email, etc.) or at particular times, notify the collector of your preference in writing. If you receive a collection letter in the mail, read it carefully. Unless you have reason to believe the letter is a fake, you should respond. Do not ignore collection letters. Present any dispute you may have with the debt and/or explain any circumstances that affect your ability to pay it. Don’t be afraid to negotiate if you owe the debt and can afford to pay something. If necessary, make an appointment for a follow-up call at a time that works for you. Make sure you keep the appointment, even if you are having trouble figuring out how to repay the debt. Being a “no-show” will not help your case and could open you up to a lawsuit or negative credit reporting. If you come to a repayment agreement, using a payment method you are comfortable with, ask the collector to put all details of the agreement in writing and give you a copy. You have a right to get your credit reports for free every 12 months at AnnualCreditReport.com. If you don’t know what debts you owe, this is a good place to start. Just be aware that not all past-due debts are reported to credit bureaus. If you have unpaid debts, be aware of your rights so that you don’t miss out on available consumer protections. Consumer Action created this guide in partnership with the Consumer Relations Consortium, a group of 20-plus leaders in the debt collection industry whose focus is on collecting the right debt, from the right consumer, the right way.